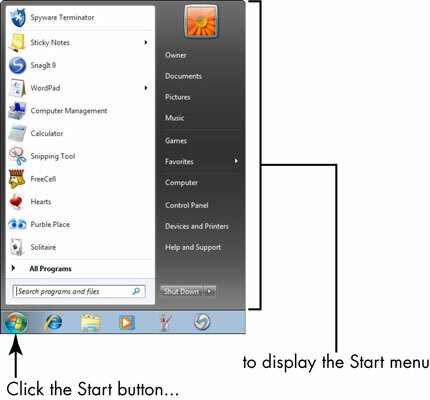 Use the Windows 7 Start menu on your laptop to access your laptop’s settings, files, folders, and software. You can customize the Windows Start menu if you like, to fit the way you like to work on your laptop. 1Press the Windows key on your keyboard or click the Start button on the desktop. The Start menu appears. You can now choose what to do, using the various items on the Start menu. 2If desired, click All Programs to display a list of all programs on your laptop, then click any program in the list. 3If desired, click a frequently used program listed along the left of the Start menu. The program opens. You can also click the arrow to the right of an application to display a list of recently used files. Click a file to open it in that application. 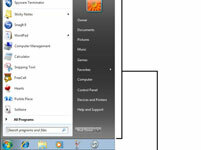 4If desired, click any category on the right of the Start menu. 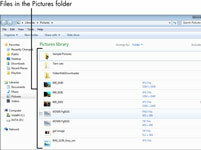 For example, click Documents or Pictures. 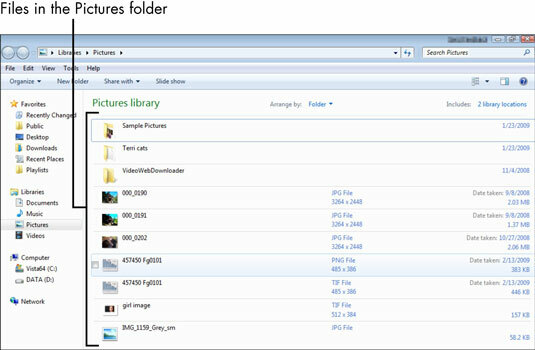 A Windows Explorer window with related folders and files appears. 5If desired, click the Power button icon to close all programs and turn off Windows. The Power button normally says “Shut Down” and that’s what it does if you click it. You can click the arrow next to the Power button instead, to display a menu of choices for putting your laptop in Sleep or Hibernate mode, restarting your laptop; or for logging off or logging on as a different user. Putting your laptop in Sleep mode is like pausing your laptop without closing open documents and programs. Sleep still uses a bit of power but allows you to quickly get back to work after only a few seconds. Hibernate mode is mainly for laptops because it saves your battery life. When you choose Hibernate (or simply shut your laptop’s lid), open documents or program settings are saved to your hard drive and your laptop switches off. It takes a few seconds longer to start up your laptop from Hibernate and display the Windows desktop, but it saves more power than Sleep. 6To hide the Start menu without doing anything, click outside it. Open the Start menu, right-click in a blank area, and click Properties to display the Taskbar and Start Menu Properties dialog box, where you can customize the Start menu behavior. For example, you can modify the functionality of the Power button and choose whether to list recently opened programs and files in the Start menu.